Bio-based Itaconic Acid Market « Global Market Insights, Inc.
Itaconic Acid Market has witnessed a dynamic change with the shifting trends from petrochemicals toward sustainable chemical materials. With rising concerns over diminishing fossil fuel resources, efforts are being made to produce chemicals from green or biomass feedstock. Growing inclination of the chemical industry base toward more high-tech and environment friendly products in order to replace petrochemicals has so far depicted strong growth chart for itaconic acid industry. This product finds key application in the production of methyl methacrylate (MMA), owing to the rising adoption of biotechnological methods in product manufacturing by the industry players. On these grounds, PMMA market, which is set to record USD 10 billion by 2024, is set to leave a remarkable impact on the worldwide itaconic acid industry. In 2004, itaconic acid was identified as one of the top 12 value added chemicals derived from biomass, which offered a suitable platform to produce polymers, biofuels, coatings, and chemical compounds. However, polymerization of itaconic acid was a key barrier to its commercial development which was later overcome by the researchers of University of Hampshire. This led to an escalated surge in the commercialization of itaconic acid industry worldwide. Accounting for more than 50% of the global itaconic acid demand, Asia Pacific has emerged as a major avenue in the itaconic acid industry. China led the regional growth and is anticipated to collect USD 20 million by 2024. Asia Pacific is drawing significant attention of the prominent industry players, owing to favorable workforce conditions and taxation laws. The industrial production of itaconic acid is highly concentrated in China including major companies such as Jinan Huaming Biochemistry, Zhejiang Guoguang Biochemistry, and Qingdao Kehai Biochemistry. European norms to curb the production of sodium tripolyphosphate (STPP) based detergents is set to propel regional itaconic acid market share from detergent applications. Furthermore, favorable government regulations to promote bio-based production for the sake of environmental safety is substantially driving Germany itaconic acid market. Exclusive properties of itaconic acid such as enabling high densities cell growth, robustness, easy to get genetically engineered, and stability have led to a higher product deployment in several applications including synthetic latex, unsaturated polyester resins (UPR), detergent builders, chelant dispersant agents, and methyl methacrylate across myriad industries such as pharmaceutical, agriculture, and lighting. Synthetic latex itaconic acid market held over half of the overall industry share in 2015, owing to its use to improve the finished product quality. Furthermore, itaconic acid is a potential green alternative to maleic anhydride in unsaturated polyester resins. The itaconic acid industry size is set to expand parallelly with the expanding UPR market, owing to the diversified product applications across transportation, construction, and marine industries. Itaconic acid industry is gaining a huge valuation on account of being a potential intermediate for the manufacturing of eco-friendly chemical compounds. 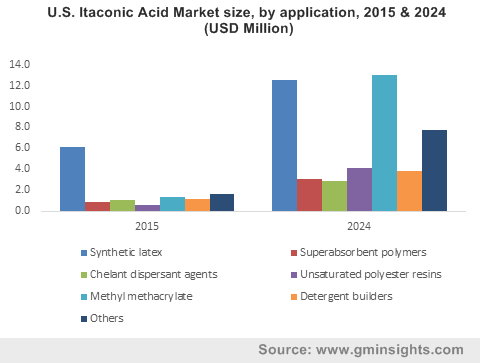 As per a report compiled by Global Market Insights, Inc., the global itaconic acid market collected revenue worth over USD 75 million in 2015 and is projected to reach USD 290 million by 2024, expanding at an annual growth rate of 16.8% over the period of 2016-2024. This entry was posted in BIOMASS, BIOENERGY AND RENEWABLE CHEMISTRY and tagged 2-methyl-1, 3-methyl-THF, 4-BDO, Bio Itaconic Acid Market, Bio-based Itaconic Acid Market, Chelant Dispersant Agents, Detergent Builders, Itaconic Acid Market, Itaconic Acid Market Price, Itaconic Acid Market Size, Itaconic Acid Market Trends, Methyl Methacrylate, Polyitaconic Acid, Superabsorbent Polymers, Synthetic Latex, Unsaturated Esters, Unsaturated Polyester Resins.